Scooper - Technology News: Is the emerging-economy growth engine breaking down? Is the emerging-economy growth engine breaking down? The world’s emerging economies seem to be losing their dynamism. Countries that only a few years ago were being hailed for their resilience in the face of a global economic meltdown are now facing myriad challenges, reflected in significantly slower GDP growth. Is the emerging-economy growth engine breaking down? From 2000 to 2007, annual growth in emerging and developing economies averaged 6.5%. More impressive, from 2008 to 2010, when the advanced economies were in recession or struggling through a fragile recovery, they managed to sustain 5.5% growth . In fact, at the end of that period, average growth stood at a very healthy 7.5%. But then growth began to slow, with the annual rate falling to 4% in 2015. Even China, the largest and most dynamic emerging economy, recorded its lowest growth rate since 1990 (6.9%) last year, and the slowdown is forecast to accelerate this year. Many now argue that the emerging economies are settling into a “new normal” of slower growth, and that their days as the key driver of the global economy are over. 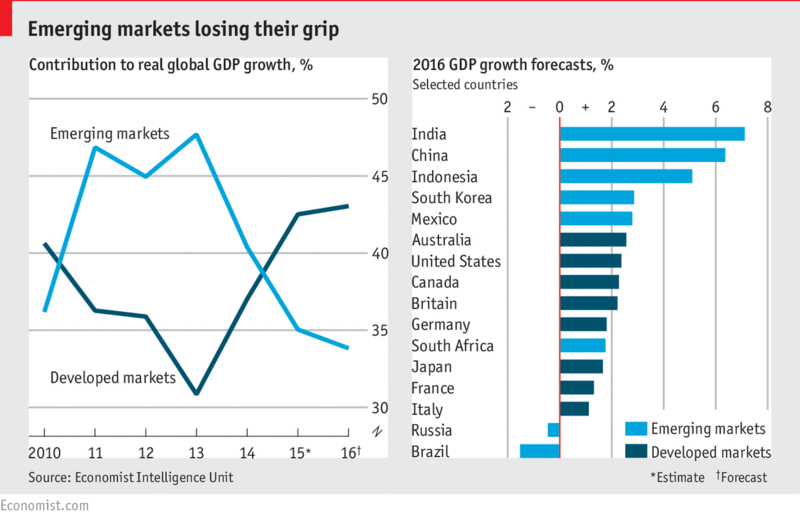 Despite their current struggles, it would be premature to write off the emerging economies. For starters, even if these countries’ growth rates do not return to pre-crisis levels, their contribution to the world economy should remain substantial, given that their share of world GDP in purchasing-power-parity terms has increased significantly, from 43% in 2000 to 58% in 2015. But the emerging economies have much more to offer. With the right policies, they can tap into as-yet-unexploited growth potential and continue their progress toward convergence with advanced-economy income levels. The key to determining what those policies must be is to understand why growth has slowed in the first place. At first, emerging economies were hit by external challenges, including weakening world trade, low commodity prices, and tight financial conditions. Global merchandise trade slowed considerably over the last four years; in the first half of 2015, it contracted for the first time since 2009. Oil and metal prices have dropped more than 50% from their 2011 peaks. Moreover, the US Federal Reserve’s monetary-policy reversal , which entails a long-delayed increase in interest rates, combined with the negative-interest-rate policies of the Bank of Japan and the European Central Bank, has caused financial-market fluctuations and left emerging economies vulnerable to capital flight. These external factors could be cyclical, but it remains to be seen how soon they will pass. The recent emerging-economy slowdown is also the result of structural factors . When the emerging economies’ growth stories began, the gap between their actual per capita incomes and long-run potential enabled rapid capital accumulation and strong technology-enabled productivity gains. But after years of large-scale investment – which, in China in particular, has led to excess capacity and resource misallocation – capital accumulation has moderated. Meanwhile, as countries move closer to the technology frontier, imitation and adaptation must give way to genuine innovation – no easy feat when innovative capabilities are lacking. So what can emerging economies do to improve their prospects? Though the particular policy mix will vary by economy, some priorities are clear. For one thing, countries must strengthen their resilience against adverse external shocks, including through efforts to strengthen their own financial systems. To reduce their vulnerability to volatile capital flows, they should promote exchange-rate flexibility, secure adequate international reserves, and adopt carefully designed capital controls. Emerging economies that rely excessively on exports need to rebalance their sources of growth toward domestic demand. Investment in public infrastructure, an improved investment climate, and social safety nets could all help to spur higher private-sector investment and household expenditure. Greater priority must also be given to structural supply-side policies targeting productivity growth. First, to strengthen human capital, emerging economies must complement their progress in educational attainment with efforts to improve schools’ quality, especially at the secondary and tertiary levels. Where necessary, education systems must be reformed to meet changing industry demand and skill requirements. Second, structural bottlenecks must urgently be addressed, through the streamlining of regulations, as well as reforms to promote competition in product markets and to increase the flexibility and efficiency of factor markets for labor, finance, and land. Emerging economies must lower barriers to market entry, support business operations, and increase access to finance. Obstacles to trade and foreign direct investment must be removed as well. Finally, emerging economies must work to strengthen their institutions. As it stands, corruption – facilitated by complex and burdensome regulatory environments, inefficient tax regimes, and weak judicial systems incapable of protecting investor and property rights – is pervasive in many emerging economies, hindering sustained growth. Improving governance and bolstering the rule of law are essential to boosting productivity and long-term GDP growth. The emerging-economy growth engine is not broken; it simply needs to be serviced. With appropriate policies and structural reforms, the emerging economies can recapture their dynamism and move onto an even stronger growth path – taking the entire global economy with them.